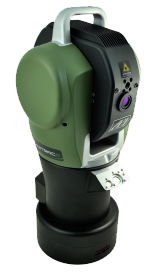 API laser tracker and probes expand the capability of our 3D scanners as well as add functionality. They are a key part of maintaining sub-millimeter tolerances on objects over 20 feet. The Omnitrac 2 (OT2) is completely wireless and only requires a few minutes to warm up. It's ready to track before our hot glue guns heat up. Battery life averages about four hours, which is more than enough time to track most large aerospace and tooling projects. The auto lock feature makes anyone look like a tracking professional. The OT2 has a camera tracking your SMR or vProbe, so if you break the beam, it immediately reconnects for seamless tracking. 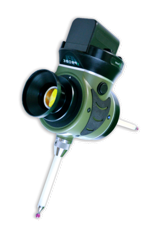 Ideal for tight quarters or complex tracking where view is obstructed. It does have the ability to run wired for use longer than four hours or if you're in a situation that doesn't allow wireless communications. When USB is connected, the wireless is disabled. Add this API laser tracker combo to your metrology department and it will be the system your team will be fighting over.